The official launch of Brazilian agrocluster « Agropolo » in Campinas, took place on 21 September 2015, on the occasion of the first Board of Directors meeting held at the Town Hall. 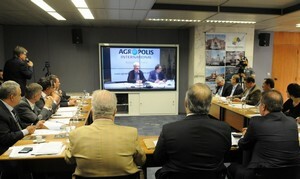 Agropolis International took part in the launch of Agropolo in Campinas as a Board member via videoconference from Montpellier. The objective is to develop strong cooperation between Campinas Science Park, Unicamp and Agropolis International members. The partnership agreement aims to develop (i) scientific cooperation, (ii) training programs, (iii) soft landing for start-up companies, (iv) cluster mentoring.